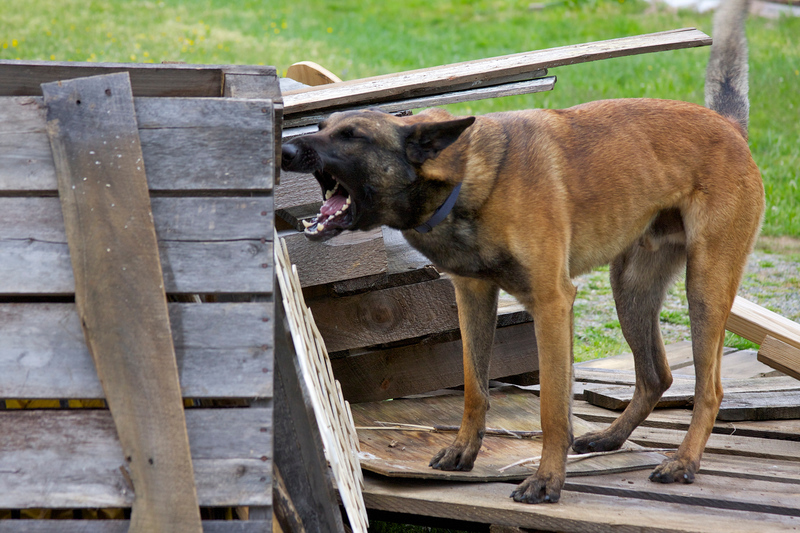 Barking: the dog must hone in on the victim or the location of the victim’s scent and bark continuously until the handler appears and the alert is over. The dog must remain within 2 meters of the victim / place of alert until the handler reaches him. The dog must not touch the victim. When the hiding place is inaccessible, the dog should indicate the location of the scent through direction giving behavior. Bringsel: Dogs will wear a special collar, on which a “bringsel” (a small elongated piece of stuffed leather or jute) is attached. The collar should have a releasing mechanism which protects the dog from injuries. When the dog has found the victim, the dog will pick up the bringsel in its mouth and return to the handler. The handler will remove the bringsel, and at the order of the handler, the dog will go directly back to the location of the victim. The dog may be free or on leash (for area only) for this return. The following would be considered faulty in a bringsel dog: running back and forth between the victim and the handler; barking before taking the bringsel, if the dog does not run directly back to the victim; if the dog drops the bringsel. Recall Refind: During the recall refind, the dog takes the quickest route back and forth between the handler and the victim thereby leading the handler to the victim or place of alert. In addition, the dog must clearly show the handler the sort of behavior that can be clearly be interpreted as alert behavior. The dog handler must notify the judge of the behavior before the test begins. The dog may be allowed to jump or nudge the handler; bark at the victim and the handler, and eye contact between the dog and the handler is also allowed. Pawing or Digging: In rubble work, pawing or digging at the location of greatest scent is also an acceptable alert. Digging can be accompanied by barking. For Tracking Tests, the IRO does not dictate how the dog should indicate the articles. They dog may indicate by lying down, or sitting or by retrieving the articles. If a dog retrieves the articles, the dog may re-start the track either from where he brings the article to the handler or where he picked up the article. For tracking tests at the A and B level, the dog will alert upon finding the victim at the end of the track. Barking, bringsel and recall refind alerts are all acceptable. The judge will be informed of the alert type prior to starting the exercise. Registration will open in May 2017. When Registration is open, payment may be made via Paypal (link will be here) OR via money order. Once registration is open, paperwork must be sent in before June 2, 2017! STEP 4: Show Your Support! Donate to help defray the costs of the trial! More information on donating will be available in 2017!